Rocco C. Cipparone, Jr. has been continuously certified by the Supreme Court of New Jersey as a Criminal Trial Attorney since 1995, and has received the highest available rating ("AV Preeminent") as to his legal ability and ethical standards from Martindale-Hubbell. In 2007, Rocco Cipparone was chosen by the federal court to be the defense attorney for the lead defendant in one of the most significant post-9/11 terrorism related trials in the United States. Mr. Cipparone has tried a large number of jury trials, and has handled a significant number of appeals. Mr. Cipparone has received numerous awards and recognition for his legal skills and efforts including as a former federal prosecutor, a list of some of which can be viewed by clicking the above link. Mr. Cipparone also has been recognized by South Jersey Magazine as an "Awesome Attorney" several times. Rocco Cipparone Jr. is honored to have been requested in 2014 to serve on the United States Attorney's Defense Counsel Advisory Committee in the District of New Jersey by Paul J. Fishman, United States Attorney for the District of New Jersey. The Committee, headed by Mr. Fishman, also is made up of Division Chiefs in his office as well as a small invited group of prominent federal defense attorneys. The Committee evaluates and discusses important issues in the federal criminal justice system that equally affect prosecutors and defendants. It is laudable that U.S. Attorney Fishman has formed the Committee and invited select defense attorneys to serve, recognizing the value of collaborative discussion among prosecutors and defense attorneys to improve the interaction for the benefit of both sides and to address issues that are equally important to both sides. Since 1991, Mr. Cipparone has been teaching at Rutgers University Law School, Camden, New Jersey, at which he teaches "Criminal Practice". In 2014, Rocco Cipparone also joined the Adjunct Faculty at Drexel University's Thomas R. Kline School of Law, at which he teaches Trial Advocacy. He also has taught courses in "Legal Research and Writing" and "Moot Court". Mr. Cipparone is a frequent lecturer (for a list of some of Mr. Cipparone's speaking engagements, CLICK HERE). Indeed other attorneys nationally seek the benefit of Mr. Cipparone's substantial experience, including by taking continuing legal education courses taught by him. To view selected clips from one such lecture, CLICK HERE. Mr. Cipparone also has lectured at continuing education seminars for lawyers sponsored by the New Jersey Institute for Continuing Legal Education, the Association of Criminal Defense Lawyers (NJ) and the Federal Public Defender (NJ), the New Jersey Assistant Prosecutor's Assiciation, and others. 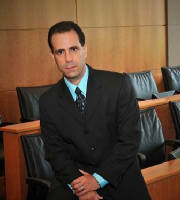 Mr. Cipparone has written several published articles regarding criminal law and trial practice. Mr. Cipparone was appointed in 2003 by the Chief Judge of the United States District Court for the District of New Jersey to a merit selection panel to consider the reappointment of a United States Magistrate Judge in the District of New Jersey. He served on the Ancora Psychiatric Hospital Board of Trustees (NJ) by appointment of the Governor of New Jersey from 2000 to 2006. Rocco Cipparone frequently is quoted and consulted by national and local television, radio, and print news media for legal analysis and comment, including CNN, Fox Television News, Good Day Philadelphia, The New York Times, Wall Street Journal, TIME Magazine, The Philadelphia Inquirer, the New Jersey Law Journal, The Courier Post, the Michael Smerconish Radio Show, The Dom Giordano Radio Show, the Paul W. Smith Radio Show, KYW News Radio, NPR, and others. ©2007 Rocco C. Cipparone Jr.